Cartography—that is, mapmaking—has been a huge part of human history for many thousands of years. Maps give us directions. They tell stories. They make it easy to share things in a way that crosses language barriers without losing impact or information. And they are one of the strongest tools we have at our disposal to communicate with each other visually. We've come a long way from using brushes and parchment—today's maps can be layered with data over satellite imagery, with accuracy down to your corner store, back up to planet-wide, and everything in between. Non-profit organizations, indigenous communities, and many other groups are learning how to harness the power of digital storytelling with new media. One of the best methods of telling their collection of local stories is to share them on a map. 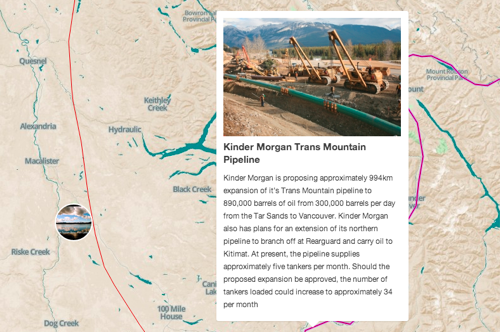 One such map we’ve developed is Standing Ground—an interactive web-map that showcases BC-based stories of environmental stewardship and struggle. Embedding videos and stories directly into the map give a site visitor the context that helps them connect the story with a real place instead of just the name of a town. The Standing Ground map makes sharing local stories easy, and viewing them in context easier. We’ve also been working closely with Kwusen Research and Media on behalf of many first nation communities in western Canada on a customized online mapping and data management system used to support consultation, environmental research, traditional land use studies and archiving. Community KnowledgeKeeper is designed to meet common data management and mapping needs of indigenous communities who are faced with complex issues of land and resource management. Some things are best explained with the help of a map, be it the growth of an organization and its reach over time, or the spread of an industry, story, or project. SumOfUs.org came to us when they needed to tell the story of how they grew from a small, local organization into the five million member worldwide movement working to make the world a better place. The SumOfUs Five Million Members map was the final result: showing the organization’s growth from zero to five million members. Certain types of information need to be recorded and displayed on a map to help people understand the full impact of the data and know what happened, when, and most importantly where. Projects like the TarSandsSOS, mapping the progress of tar sands tankers through sensitive regions of the BC coast, show the power of these communications. Knowing, to the minute, when and where a ship with the potential for an environmental disaster (in the worst-case scenario) helped visitors see the immediate effect and constant impact of shipping through these areas. The proposals by oil companies to increase the ships passing through these regions by 700% suddenly became a much more immediate and arresting thought, with the help of the map. Coastal Guardian Watchmen Network is a project that allows First Nations Guardian Watchmen to record commercial and recreational activities on the North and Central coast of British Columbia. Our system takes information from the GPS devices from the patrols and places it onto maps. We are developing another project with custom data driven map tiles generated from provincial road permit and industry reported road safety data. This data gives resource companies an overview of the state of their roads so they can easily address problems and keep their employees and others using the roads safe—maps with the potential to save lives. 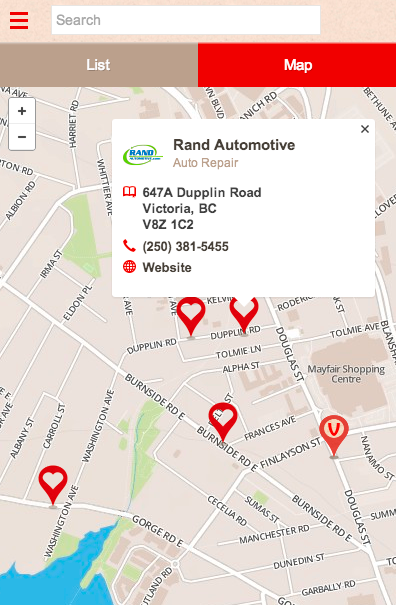 Working with Vancity, we developed a mobile website that encourages individuals to look for and shop locally at small businesses. Localty, currently running as a pilot project in the Victoria market, grants points and badges to its users for supporting local shops and businesses, and helps them find the businesses they need using geo-location services on their mobile phones. Peacegeeks and Affinity Bridge have worked together on two separate mapping projects. The first was for the United Nations Refugee Agency (UNHCR), that uses mapping technology to show the locations and types of aid and services available to Syrian refugees in Jordan, known as Services Advisor. The second collaboration has been on the mapping aspects of Peacegeeks’ Project Amani. We built an integrated data mapping system used to track critical issues in developing and conflict-afflicted areas of the world. In addition to tracking these issues, the map is also being used in exciting initiatives on mapping positive stories like safe zones. One of our earliest mapping projects was working with the Vancouver Aquarium on the Great Canadian Shoreline Cleanup. The project included geolocation and map-based searching functionality, showing cleanup sites with details on the status of each site, whether it needed cleaning, and whether or not a group had chosen to work on that area. But enough about us. It should be obvious by now that we like working with maps to help connect people and information. What are you working on? How can we use our mapping expertise to help you? Let us know what stories you want to tell.